The Picker works with Internet Explorer 10 or later. Older versions are not supported. When you try using the Picker for Internet Explorer, you either do not see a Picker menu at all or you receive the message "Page not found". The Picker is not installed (in the shortcut menu the entry Citavi Picker does not appear). Click Control Panel > Uninstall a Program > Citavi [version number] > Change > Modify. In the dropdown menu next to Picker for Internet Explorer, select This feature will not be available and continue the installation. Close Internet Explorer if it is running. Click Control Panel > Uninstall a Program > Citavi [version number] > Change > Modify. In the dropdown menu next to Picker for Internet Explorer, select This feature will be installed on local hard drive and continue the installation. The Picker is not enabled (the entry Citavi Picker appears in the shortcut menu, but you receive an error message if you click it). In the upper-right corner of Internet Explorer, click Tools. If nothing happens when you click Citavi Picker, the Picker cannot be activated because the option "Enable third-party browser extensions" is disabled. Activate the Enable third-party browser extensions checkbox. If there still is no reaction when you click Citavi Picker or if this option was already selected, please uninstall and reinstall the Picker as described above in Solution 1. You're using Internet Explorer's InPrivate Browsing mode. The setting InPrivate Browsing disables the Picker and all other Add-Ons. To use the Picker, open a new window in Internet Explorer without enabling InPrivate Browsing. Select the Gear in the upper-right corner of the screen or the "Tools" menu if you have the menu bar enabled, then select "Internet Options". Select the "Security" tab (screenshot: 1). Select the zone you wish to modify. In most cases, it will be "Internet" (screenshot: 2). Select the "Custom level"button (screenshot: 3). 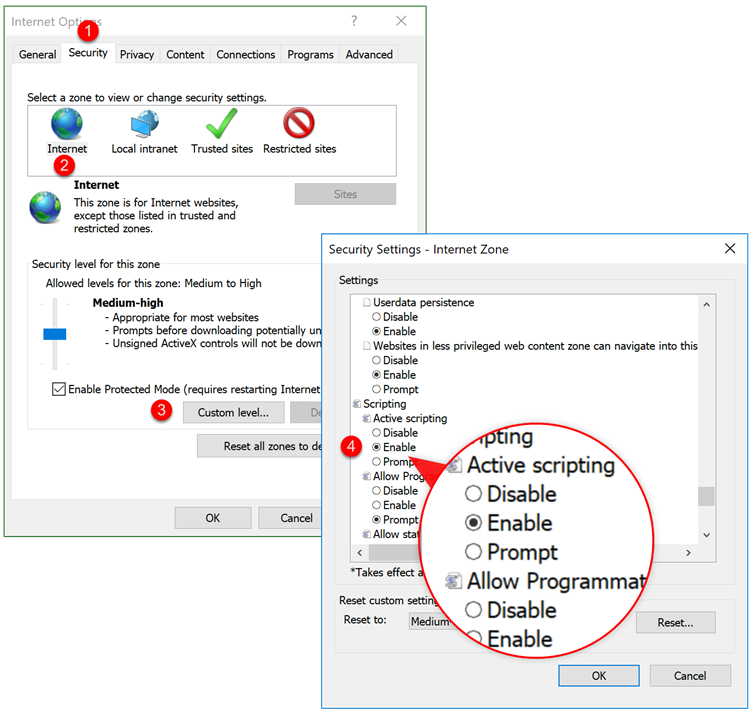 Scroll down to the "Scripting" area and select the radio button to "Enable" it “Active scripting“. Certain Internet Explorer settings are blocking the Picker. Click Reset. Please note: This command deactivates all Add Ons. If you entered proxy settings in Internet Explorer, please make note of these settings before you deactivate the Add On and enter them again afterwards. Select the Citavi Picker entry and then click Enable all in the lower-right corner of the window. Activate any other disabled Add Ons.